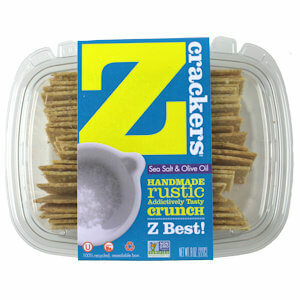 Z-Crackers are award-winning crackers that are handmade, hand-cut in New York City on a daily basis. 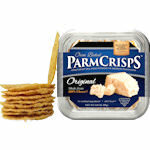 They've got a cornmeal crunch and are sophisticated enough to go with the finest cheese, spread or dip. Keith and Pam Pollack, the master minds behind the Z-crackers developed these addictive crackers while experimenting with the dough they used to make for their savory pies. 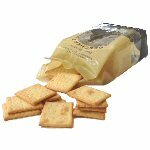 Sea Salt and Olive Oil is the most basic and most popular Z-cracker. It was created to enhance the flavor of any pairing. 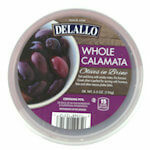 Try it with: Brie, St. Andre, salsa, hummus, dips or crumbled into soup. 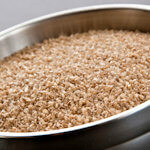 Ingredients: Unbleached enriched wheat flour, (wheat flour, malted barley flour, niacin, iron, thiamin, mononitrate (vitamin B1), riboflavin (vitamin B2), folic acid), water, cornmeal, canola oil, wheat bran, salt, olive oil, sea salt.